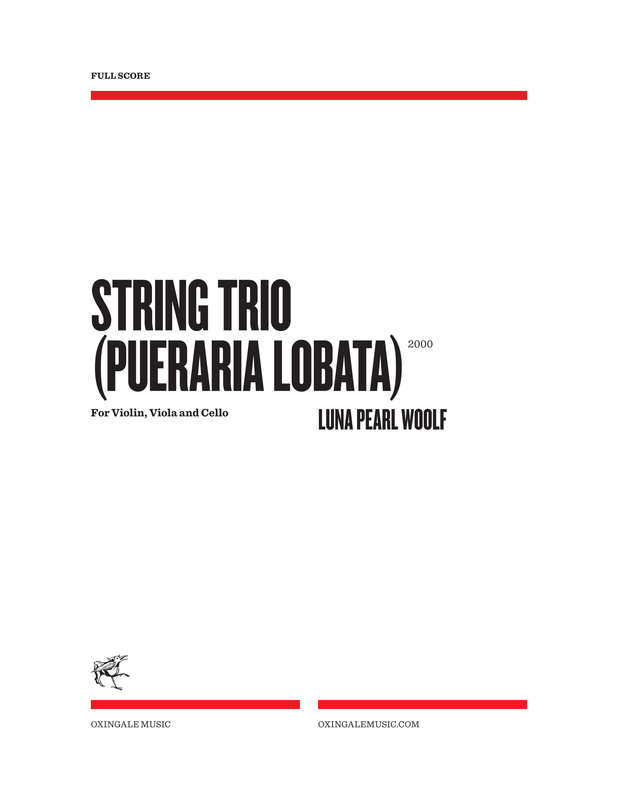 String Trio (Pueraria lobata) was written in 2000 and premiered at the opening celebration for the David Kinsey Memorial Garden in Amherst, Mass. The subtitle, (Pueraria lobata), was inspired by that context and comes from the Latin name of the kudzu vine. Opening with a faint tremolo in the viola, I. A Creep crawls out of a haze, peeking into the world like a germinating seed. The instruments differentiate, flitting around a central, repeated-note figure that is tossed from player to player. The thickening polyphony erupts into a forceful yet unstable reckoning of the opening music, undone abruptly by a jagged decay. II. At the Promenade begins with an elegant, rhythmically quirky dance in the ‘cello. The violin picks up this theme clumsily, with naive enthusiasm, and the viola corrects it with its own staid, pedantic version of the music. The dancing lesson continues in earnest with a waltz, each instrument experimenting with the role of leader and follower. After a laugh the original elegant theme returns as the subject of a free fugue. Finally the violin finds its groove and everyone collapses into laughter. In III. Skirmish, aggressive, serpentine passages wind and crimp around each other, giving way periodically to highly accented, homophonic music. Suddenly, this frenzy is suspended and a slow section, reminiscent of the previous movements, provides some relief. 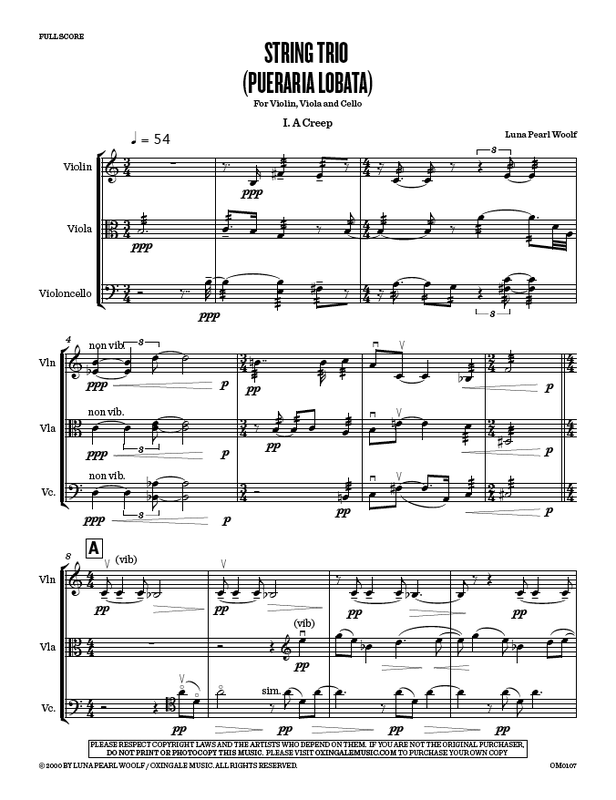 In the finale, like children after hard play, the music reverts to a state of innocence, recalling the opening of the piece and leaving a hint of tremolo suspended in the air. This entry was posted in Cello Music, Chamber Music, Chamber Music with Cello, Luna Pearl Woolf and tagged A Creep, A Skirmish, At the Promenade, jones library, string trio, viola, violin, Woolf audio clips. Bookmark the permalink. Sounds like a delicious piece.